A World Without Danger EOPM is provided for you and if you think it can be optimized such as adding the dynamics etc, welcome to provide us with the more perfect A World Without Danger EOP and EOPM! 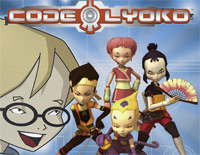 A World Without Danger is the title theme of Code Lyoko. The French version, Un Monde Sans Danger, is performed by Julien Lamassonne. The English version is performed by Noam Kaniel. The Spanish title is "Un mundo sin peligro". The French and English versions can be found on the French and English Subdigitalssoundtracks. One of the comics has a concert mentioning this song.